We all get off-track from our financial goals once in a while. Sometimes it happens because of unexpected expenses -like car repairs or a health problem. Other times we get off-track because we lose sight of our way. We forget why we set financial goals and why we work so hard to be frugal day in and day out. We temporarily let our purse strings loose, and we start spending money on wants instead of needs. I’ve been there, and I’ve fallen off track with my financial goals for both of these reasons in the past. In fact, just last month I had to pay for some expensive car repairs, and I also let myself succumb to the pressure of a want that’s been on my list for a long time – a Keurig coffee maker. But even though I got a little off-track, I don’t want this derailment to make me lose sight of my big financial goals, like getting out of debt and building up a full-funded emergency fund. 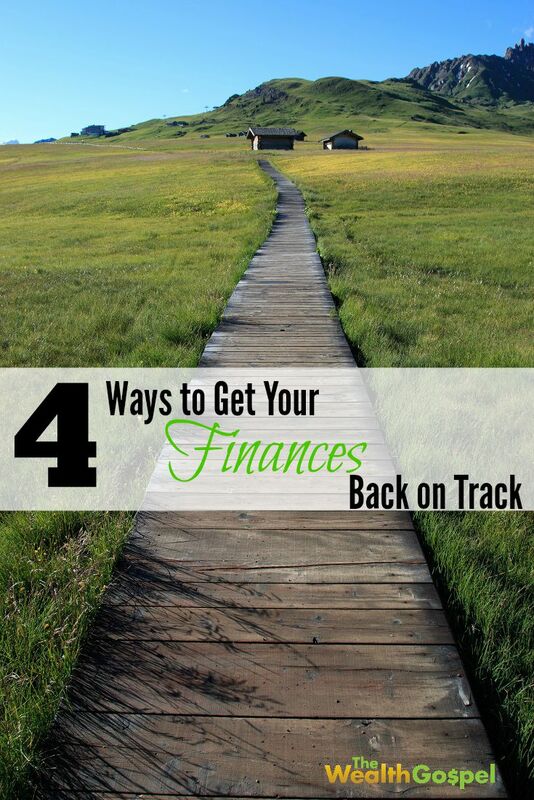 So, here are 4 things I’m doing to get back on track financially, and you can too! Taking a little time to sit down and map out “why” you want to achieve your financial goals is usually good motivation to help you get back on track. This might mean making a dream board, or even just jotting down some key words or phrases that remind you “why” you want to achieve your financial goals – no matter what they may be. If you’re like most people you pay all your bills for the month, spend what’s left and never end up with anything left to save. I used to do this too, but now I save first and spend later. By putting even a little bit in my savings immediately when I get paid, I’m already headed in the right direction with my finances for the month. Even if I don’t end up with anything “extra” when all is said and done, at least I put a little bit toward my savings goal. Shopping bans aren’t for everyone. But, if you have a hard time letting yourself spend money on wants in moderation, perhaps you’d be better off with a no-tolerance policy instead. Although my first shopping ban wasn’t a success, I’m doing much better this time around. It’s really helped lower my monthly budget by cutting out things I don’t really need to spending money on each month. Another exercise that helps me put things in perspective and get back on track is to go through my house and eliminate clutter. When I really look for clutter in cabinet, drawers, and closets, I can usually find a lot more than I expected. This always makes me realize that I wasted money buying that item. Instead of spending my money on stuff, I could’ve put toward my big picture financial goals instead. Plus, clearing out clutter makes me feel so much better about life in general. Have you ever gotten off track with your finances? What did you do to fix it? Many times, sitting down and writing your goals will help. Sometimes you’ll see that your goals may be a little different, in which case now you can set a path forward. In other times, your goals may be exactly the same as what they once were, but if that’s the case, then the act of writing them down brings back a level of accountability and can add motivation to get back on track. Great idea! Our goals do change sometimes and that might be going in a different direction altogether. Best way of getting back on savings is to pay yourself first, or as you put it save. The other important area is to focus on the why. Our subconscious is amazing at focusing on your deep down reasons and directing us even when we do not realize it. Having a deep and strong enough why helps us stay on track. I write my goals down 2-3 times a day just to keep myself focused on my whys and direct myself in all aspects of my life. Dang! I don’t write down my goals that often, but they are usually at the fore-front of my mind. Great idea! I check my accounts daily anyway, but if you don’t this would surely be helpful to get you back on track.